BodyMindLife was born out of a desire to empower transformation through the practice of yoga, pilates, anti gravity and meditation. They have 4 locations across Sydney with over 300 classes each week and also offer accredited teacher training. With 1000’s of student coming through the doors each day they are well known as the leaders of the yoga industry. 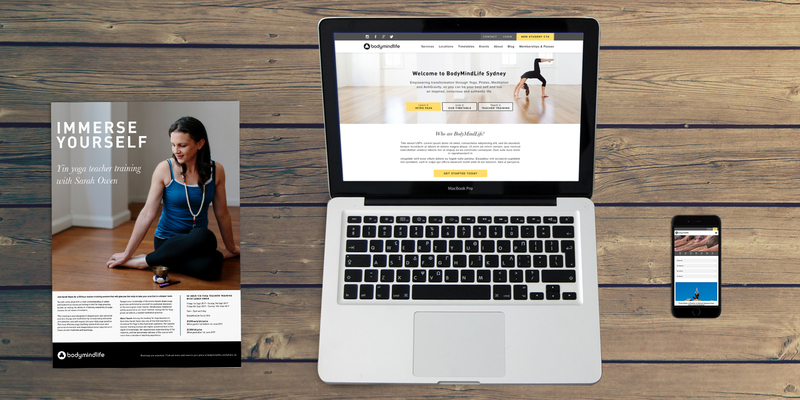 BodyMindLife approached us to redesign and develop their website to make it more user friendly and integrate with their booking platform MindBodyOnline. It was crucial that we maintained the existing brand and extended this feeling and expectation of high quality to the website. We developed a system that allowed the customers to login and book classes as well as manage their membership options. We also help BodyMindLife produce a myriad of printed collateral that can be seen around the studios. This ranges from postcards & posters to signage.